Grant Howard has been an industry leader in the development of distinctively designed kitchen and tabletop products for the past 30 years. Our goal is the production of unique, well designed, and functional items that fulfill the needs of today's demanding consumers. These creations are fashioned by innovative industrial engineers and designers from around the globe. As a result, these product selections are diverse in appeal, elegant, quality driven, and competitively priced. Our company's continued success is our ability to combine various mediums with a wide array of creative applications. Presently, the Grant Howard collection incorporates glass, metal, ceramic, and wood to achieve its goal in providing our customers with products and designs that meet their needs. These end products are either solid color, clear, hand painted or decaled which enhance their artistic value. The Grant Howard corporate structure currently consists of two divisions. The first revolves around our ever growing wholesale base of retailers. These outlets are promptly service by our sophisticated and computer driven warehouse facility. Our company will not and does not sell directly to consumers. If the need arises, Grant Howard does have the ability to customize and develop proprietary products utilizing our design team for our retailing customers. The second division is an industrial application. 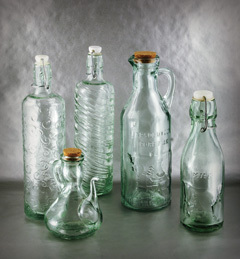 Our company has the talent, skill, and capacity to design and manufacture glass bottles and jars for repackaging. State of the art design/mold technology and equipment have provided many manufacturers with the vehicle that was needed to enhance, protect, and showcase their product. On the ensuing web pages you will find a pictorial representation of the entire domestically warehoused Grant Howard collection of kitchen and table top products. The selection is diverse and represents a vast array of items. Please feel free to contact our office or your local sales representative with any questions. If you require information concerning our industrial capabilities please contact the main office directly. We look forward to answering your questions and serving you in the future.